Last summer, I was hiking through the west of the Hardangervidda in Norway: 100 km in a week through an area without cellphone reception, no internet, no obligations, and no rush. Nonetheless, the group that I had joined was walking at a swift pace. So much so that I was wondering whether some of them came to enjoy nature or whether this was an alternative for the gym. Of course there’s nothing wrong with that, but when you’re rushing through a beautiful nature reserve as if you need to catch the train, you are missing many beautiful things. And that’s a pity. The mountain plateau through which we walked is above the tree line and the vegetation consists primarily of shrubs, grasses and mosses – just like the tundra in the Arctic. In fact, many of the plants that grew there are the same ones that I studied as a PhD student when I was doing research in Northeast Siberia, more than 5000 km and three days traveling away. For instance, I saw dwarf birch growing everywhere, a small but brave shrub that has an astonishing survival skill: In Siberia, this plant withstands temperatures as low as -45 °C. It wasn’t that cold in the Hardangervidda. But a formidable amount of snow fell in the previous winter – up to several meters in some places. Because of this large amount, and the cold spring, snow was still lying around at many places, even though it was the middle of August. Exceptional. At every hut we were told that this really wasn’t normal for the time of year. The plants also felt that it wasn’t a normal year. There were lots of places where the snow only recently had melted and shrubs just started to unfold their leaves. I repeat: in the middle of August. Even the distant relatives of these plants in Northeast Siberia started this at least one and a half month earlier. Without a doubt, it must have been quite challenging for these plants to sufficiently grow and prepare themselves for the next year. But this was an exceptional situation. Normally, snow is a good friend to these shrubs since snow insulates and protects plants against severe cold. Those temperatures of -45 °C in Siberia? That’s only the case in the air above the snow. Trapped in the snow, these shrubs are relatively safe. When snow cover is about the same height as the shrub, these plants can thrive just fine. No, a lack of snow can be much worse. For example, a large number of plants throughout the North of Norway were damaged during the winter of 2011-2012 because of alternating cold spells and sudden thaw events. When thaw removes snow in the middle of the winter, and followed by severe cold, plants are completely exposed to low temperatures and they can get frost-damaged. Or even worse: when there’s no snow altogether. In January of 2014, fires raged on several islands in front of the Norwegian coast because there was no snow, and the dry vegetation easily caught fire. This wouldn’t have happened if there had been snow. This is exactly what can happen with climate change. Even the large amount of snow in the Hardangervidda last year is in line with changing weather patterns as predicted for Norway by climate models. More precipitation, which falls as rain in the warm valleys, falls as snow on the cold mountain tops. But if the climate warms even further, eventually that snow will also turn into rain. A tough one: Dwarf birch, photographed here on Hardangervidda, also grows in the Arctic and can withstand temperatures as low as -45 °C. But how will this plant cope with large changes in climate? So it’s important to figure out how plants adapt to this new situation. 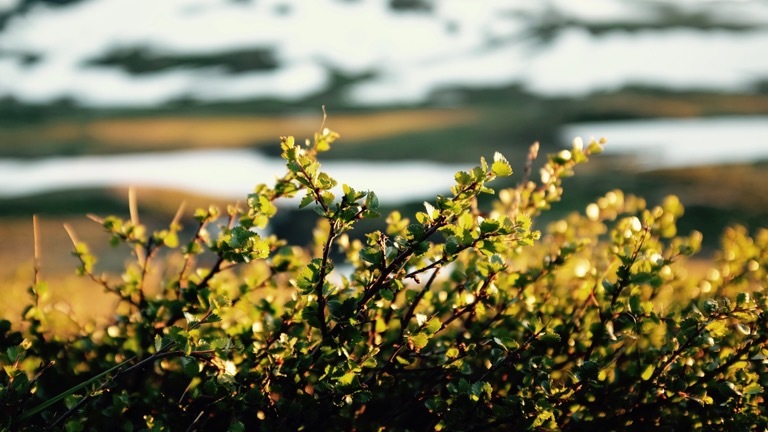 Research from, among others, the Norwegian Institute for Nature Research, NINA, clearly shows that plants in Northern Norway, and elsewhere in the Arctic, are thriving less well lately – and this is possibly the result of changing winter weather. But precisely how these issues relate to each other is not entirely clear. An added problem is that climate models can predict the changing winter weather, but aren’t skilled enough to predict how plants will respond to these changing conditions. Besides, changes in weather aren’t just a problem for plants. On Svalbard, for example, it has rained several times in the middle of the Arctic winter in the past couple of years. Also during last winter. The rain then freezes and forms a thick layer of ice on the ground. This layer of ice is a huge problem for reindeer since it prevents them from getting to lichens, their food, and many of them die. Similar situations have happened in Greenland, where muskoxen encounter the same problem. This is also an economic problem. Changes in weather patterns can have large consequences for agriculture. The same ground ice formation that makes it difficult for reindeer to reach their food, can also damage crops. This leads to a lower harvest, and insurance claims from farmers. Although our changing winter weather already is a serious problem for plants and animals, we don’t know well enough how this will change in the future. Will this sort of weather occur more often? And if this persists, how will it affect plants in the long term? Does nature get damaged so much that other plants and animals will take their place? Winters in Norway are changing. The weather that we experience as exceptional today will be normal for a following generation. After all, they won’t have known anything different. But whether nature will adjust itself just as easily, remains an open question.